Kitty Hawk Kites will be bringing Stand up Paddleboarding and Surf Lessons to the VA Beach area starting in late June 2016. New Surfing and SUP Lessons / Tours are now available for 2016! Want to go see the famous wild horses of Carova, NC but don't want to fight the traffic of the Outer Banks? Take a Water Taxi from Knotts Island over to the NC side of the Carova Beach and be picked up by Corolla Outback Adventures for a tour of the northern and most isolated beaches of the NC coast. This tour is 2.5 hours long which includes a 10 minute water taxi over to the Carova area. You will then be guided and driven in a custom 10 passenger four wheel drive vehicle. Your guide will take you into the Wild Horse Conservation Easement and other areas accessible only by us. Horses are often seen galloping along the beach or cooling off in the surf. Along the way an ancient maritime forest at Wash Woods can be seen with stumps rising from the sand and extending out into the surf. The tours are led by experienced guides who are knowledgeable and informative about the area and its history. 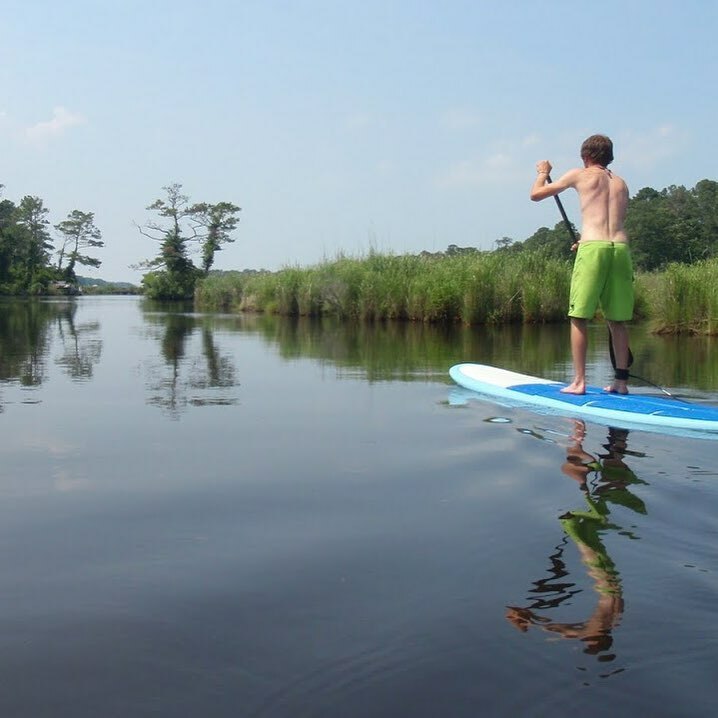 Take a SUP Tour down Owl Creek near VA Beach's famous Rudee Inlet! Owl Creek is perfect for beginners with calm waters and plenty of room to explore this unique estuary. Each session includes a brief paddling lesson before heading out on the tour. This is the ideal offering for adults and teenagers. Private lessons/tours are best for families with younger kids. Take a Kayak Tour down Owl Creek near VA Beach's famous Rudee Inlet! Owl Creek is perfect for beginners with calm waters and plenty of room to maneuver. Each session includes a brief paddling orientation before heading out on the tour. This is the ideal offering for the whole family. Join us for a great day on the water. Private Surf Lessons are the perfect way to advance your skills and learn to surf as quickly as possible. With an individual private, you'll have 1:1 instruction and complete focus on your skills. Surfboard and leash are provided. Bring a friend! Private Surf Lessons are the perfect way to advance your skills and learn to surf as quickly as possible. You'll have 2:1 student to instructor ration with more focus on each of your skills. Surfboard and leash are provided.